Secret legal advice ordered Scottish Ministers to keep Law Society exempt from Freedom of Information. BLACKED OUT DOCUMENTS containing secret legal advice issued by taxpayer funded Scottish Government lawyers show that Scottish Ministers WERE ORDERED by the legal profession to allow the Law Society of Scotland to keep its much coveted yet little-talked-about exemption from Freedom of Information legislation. 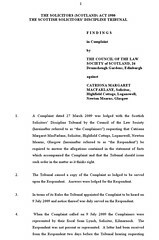 The censored advice, issued by lawyers working for the Office of the Solicitor to the Scottish Executive, who are themselves, fully paid up members of the Law Society of Scotland has led to a policy by the present Scottish Government since it was elected in May 2007 to mislead members of the public, consumer groups, law reformers and FOI campaigners on the question of making Scotland’s legal profession accountable under Freedom of Information legislation. Scottish FOI Commissioner Kevin Dunion. 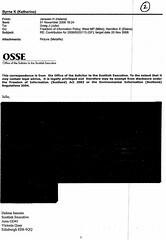 The so-far secret documents relating to the Scottish Government’s attempts to keep quiet about their involvement with the Law Society/FOI issue, have only now been grudgingly released by the Scottish Government in an attempt to persuade Scottish Information Commissioner Kevin Dunion from ordering the full disclosure of the legal advice, which has led to a policy of misleading the public for several years on the question of making the regulator of Scotland’s legal profession comply with Freedom of Information laws. Secret papers disclosed during FOI investigation show Scottish Government ‘is afraid’ of Law Society of Scotland’s legal challenge against Freedom of Information compliance. 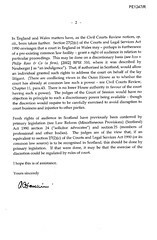 The move to keep the Law Society of Scotland free from scrutiny under Freedom of Information legislation will avoid any possibility that clients, the media and the general public could use FOI laws to find out key details of regulatory procedures at the Law Society itself, which are famed for allowing crooked lawyers to continue working no matter what they do to clients, discover actual records of complaints histories of Scottish solicitors, the criminal records of solicitors and staff working in the legal services sector, and also allow clients access to their own personal files held by solicitors, which are often ‘held to ransom’ by solicitors demanding payment before being handed over, in a vastly edited format. 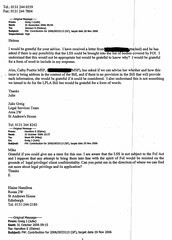 Emails between Civil Servants show Scottish Government fear Law Society action against Freedom of Information Scrutiny. A legal insider said last night : "I understand the Law Society warned the current SNP Scottish Executive and the previous administration that it would legally challenge any attempt by Scottish Ministers using Section 5 of the FOI(S) Act to bring them into compliance. The documents now released seem to confirm this.”. He went on : "The civil servants talking about how the Law Society would challenge against any such move, using 'legal privilege' and 'client confidentiality' is very much spot on in terms of what tactics the Law Society would use to prevent itself being made compliant with FOI legislation although I also understand from colleagues that an option of Judicial Review would have been used by the Law Society, should the then Scottish Executive or present Scottish 'Government' have proceeded to bring the Law Society within the scope of FOI." 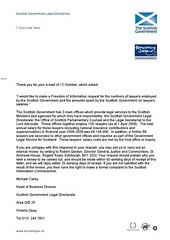 One Scottish Government civil servant wrote in an email between legal departments : “I am aware that the LSS (Law Society of Scotland) is not subject to the FoI Act and I suppose that any attempt to bring them into line with the spirit of FoI would be resisted on the grounds of legal privilege/client confidentiality.”. However letters sent out on the authorisation of the Justice Secretary, Kenny MacAskill to FOI campaigners claimed “No decision have yet been taken as a result of [a consultation on Freedom of Information in Scotland'] and Ministers are currently considering the requirement for any action on the issues considered, including coverage of the [FOI] Act” clearly portraying a deliberate policy by the Scottish Government to mislead the public with regard to FOI issues & the legal profession in Scotland. Scottish Ministers will fight to prevent public knowing why lawyers are exempt from FOI legislation. While the legal advice apparently ordering Scottish Ministers to allow the Law Society of Scotland to keep its exemption from FOI legislation was made during the previous administration, the current SNP controlled Scottish Government have now forcibly warned Scotland's FOI Commissioner, Kevin Dunion, that they will fight to keep the public from knowing that Ministers have in effect been bullied by the Law Society of Scotland into keeping the Scots legal profession free of public scrutiny which would come with FOI compliance. Law Society of Scotland & Faculty of Advocates remain secret, unaccountable to FOI scrutiny. The Law Society of Scotland is one of two key regulators charged with overseeing Scotland's legal profession, the other being the Faculty of Advocates who also enjoy complete immunity from Freedom of Information legislation, making the two regulators of Scotland's legal profession a dangerous unaccountable duo of self regulators who are subject to no oversight other than a passing glance from the beleaguered, scandal hit Scottish Legal Complaints Commission, who have spent the last year rubber stamping investigations into crooked lawyers carried out by the Law Society & the Faculty. Iraq War : SNP MPs badgered for Cabinet Minutes release on war ‘legal advice’ but now SNP Scottish Ministers will use public money to protect Law Society from FOI & fight release of Scottish Govt’s lawyers advice. 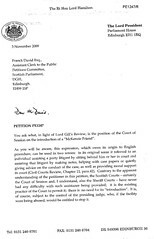 This fight by the Scottish Government to keep information from the public which involves elements of the Scottish legal profession bullying the Government into submission over FOI protection for the public is in stark contrast to the SNP's position over the FOI battle for release of Cabinet meeting minutes from the Westminster Government in relation to the Iraq war, where, in a similar situation of legal advice against FOI release,UK Government lawyers based in Westminster also argued it would be against the public interest to release the Cabinet Minutes. The now famous but still secret Cabinet Minutes containing references to the legal advice given to the Government on the legal basis of the war in Iraq, were ordered for release by England's FOI Tribunal which backed the original decision by the Information Commissioner for England & Wales, Richard Thomas, ordering the release of the Westminster Cabinet Minutes. However, Scotland has no FOI Tribunal, therefore the FOI Commissioner, and even applicants to the FOI Commissioner’s office must rely on going to the Court of Session in Edinburgh to force the release of information that Scottish Ministers may resist disclosing to the bitter end. A senior official with one of Scotland’s consumer organisations branded the Scottish Government’s stance over the legal advice as “a grave mistake” and condemned the lack of attention to a clear public interest in making Scotland’s legal profession’s senior regulator comply with Freedom of Information legislation. “If you find out through FOI your lawyer is a habitual crook and has rolled hundreds of clients, you are not going to use them or their firm for anything. I believe it is the desire of the Law Society and the profession to protect their secrets which we are seeing as the Government’s driving force of maintaining an indefinite exemption rather than groundless arguments of client confidentiality." Clearly, the public interest would be served by making the Law Society of Scotland & Faculty of Advocates compliant with Freedom of Information legislation and continuing the present secrecy which allows both of these powerful regulators to remain outside the law and outside the reach of public scrutiny & accountability is only helping those within the profession who are exploiting such weaknesses for their own benefit against the public and all users of legal services in Scotland. Politicians & consumer groups feel SLCC is having a laugh at Scots public. THE SCOTTISH LEGAL COMPLAINTS COMMISSION, which is due to publish its first annual report in December, has been roundly condemned by politicians, consumer groups, and members of the public forced to approach it over complaints against 'crooked lawyers' as being an expensive, incompetent & anti-consumer quango which is focussed more on salaries & expenses than its once promised task of cleaning up mounting complaints of corruption in Scotland's legal profession. SLCC Chief Executive Eileen Masterman at 70K a year was named in a survey as one of the highest paid quango Chiefs in Scotland. 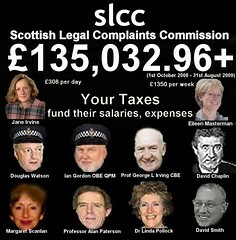 While board members of the SLCC have raked in a staggering £135,000 plus in expenses claims over the past year, and its Chair, Jane Irvine nets £308 plus, a day, along with Chief Executive Eileen Masterman who gets a whopping £1350 per week, the complaints body has shown itself over the past year to be a very poor regulator of complaints against ‘crooked lawyers’, leaving many clients finding their complaints have been ‘whitewashed’ in a way reminiscent of the Law Society of Scotland’s Client Relations Office investigations, which are well known to have let thousands of crooked lawyers off the hook from even the most serious of complaints. MSPs have been asked to assist consumers caught out by anti-client SLCC. While the SLCC has focussed on huge salaries and expenses claims, little by way of complaints victories for consumers have been achieved by the cash hungry quango. The public’s dealings with the SLCC have now reached such a low point that MSPs across Scotland have been called in by many constituents to help complainers get the SLCC to give them a fair hearing that Justice Secretary Kenny MacAskill had promised would be routine with the failing SLCC, once styled as a 'new broom' but which has now lost its bristles, and it seems, the will to address public complaints against the legal profession. This morning, an MSP spoke of being called in by a constituent to ask the Scottish Legal Complaints Commission why it had continually failed to address serious issues in a complaint made against a rogue solicitor and his law firm which now includes a complaint against the Law Society itself. The Scottish Legal Complaints Commission was asked for information on how many MSPs had contacted it over problems faced by constituents who had encountered difficulties with the law complaints body. However, the SLCC refused to hand over any information or documents on this subject, and tersely said that requests for such information would now be charged for. 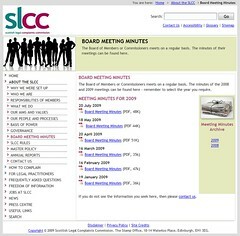 Quango secrecy to maximum as SLCC website reveals lack of board meeting minutes and accurate information on its actual performance. 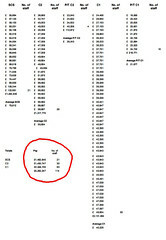 While the SLCC was being secretive about its own difficulties and the lack of trust it suffers from public & politicians alike, the quango’s own website amazingly reveals today that up to today, 23 November 2009, it has failed to post any board minutes since July 2009, begging the question what has the Commission actually been doing all this time, while its members have been raking in huge expenses claims & salaries while complaints and the public have become its last priority. An insider commented on the lack of minutes information, claiming that due to poor media coverage which had revealed the SLCC to be unfit for purpose, the commission had now taken the decision not to release much information on its internal workings to the public, for fear that the details of its daily operation and board meetings would continue to portray it to be a pro-legal profession body, rather than an impartial regulator of consumer complaints against poor legal services. "We need to move on from this mistake and create a fully independent regulator that is able to do the job the SLCC was supposed to do, but cannot do due to overwhelming influence and control from the legal profession itself." Well, I can only agree with the sentiments expressed by others, that the Scottish Legal Complaints Commission is most certainly, unfit for purpose, and should be replaced with a fully independent body which operates under external oversight, and is free of influence & control from the legal profession, to ensure that consumers are fully protected from the many rogue elements of Scotland’s very poor, untrustworthy, legal profession. In some cases, notes of proceedings in Scottish courts 'are worthless'. Litigants who use Scotland's courts for civil proceedings have today been advised to take along witnesses or their own note takers, after revelations emerged in several long running damages actions of a pattern of serious omissions in the official notes of court proceedings which have in some instances, heavily compromised litigants legal positions and ruined clients trust in their own legal representation who were found to be less than competent during court proceedings. Despite the fact Scotland's courts have had recording equipment fitted several years ago, notes from cases heard in Scottish Courts including the Court of Session, which have involved challenges against professions such as medical negligence claims against Health trusts, negligence claims against the legal & financial professions and even challenges against public bodies including Government department, have revealed that rarely do the full judgements or even court interlocutors contain a fully accurate account of the events which actually took place in court in front of litigants, leaving many court users bemused or facing severe difficulties in their cases or legal positions. Unsurprisingly, these omissions in court documents & judgements seem to have a habit of occurring particularly where issues involve failures of litigants legal counsel, or in one example quoted to me, where a judge had heavily criticised a litigant’s legal team for not entering medical evidence into pleadings, which the litigant had only found to have been not produced after he had himself written to the Scottish Courts Service enquiring what papers his legal counsel had actually filed. In an example of a case where ‘dodgy note taking’ seems to have omitted key criticisms from the bench of a pursuer’s legal team who were representing a victim of medical negligence, a full list of medical examinations made by independent experts, and key expert witness testimony on the pursuer's condition and treatment in hospital had not been entered into evidence – this despite the pursuer having a letter from his solicitor giving a full numbered list of productions to the court, which in reality did not exist. It appeared in this particular case, the pursuer’s legal team never expected the case to go to proof, and the whole episode only came to light when the sitting judge asked the pursuer’s QC where were the medical reports of his client, leaving the pursuer’s legal team speechless and asking for an adjournment to a later date. Sadly none of this was recorded in the report of the hearing that day, and now the pursuer finds himself without legal representation, after questioning his solicitor why he was told his productions had been entered, when clearly they were not. Clearly problems do exist with transcripts of courtroom activity, which as Lord Gill concludes himself, would easily be curtailed by the digital recording of all evidence in civil cases. While Lord Gill’s recommendations are being considered .. and lets hope the powers that be don't take the usual eternity to consider them … if you feel you need a witness to your civil court hearing, which I would certainly recommend you do, take along someone with a pencil & notebook – it may very well save you later on if something goes wrong. Courtroom notes and your lawyers version of events after the hearing may sound all well & good, but time & again, the most important references of events which end up determining whether your legal team have acted in your interests or otherwise, are simply not there fin the shorthand writer’s notes for you to refer to later on when difficulties arise. An extra body with a notepad may well be your saviour when needed later on. Scottish Government now have hundreds of lawyers paid for by taxpayers. While thousands of ordinary Scots struggle trying to find or afford legal representation in our own country, documents released under Freedom of Information legislation reveal the Scottish Government has quietly authorised a multi million pound doubling of the numbers of lawyers employed by the current administration, at a total cost to taxpayers of well over the £8.1 million salary only figure released in response to information disclosure requests. FOI reveals MacAskill likes lawyers so much, he's employed over two hundred of them at our expense. Today it can be revealed the Scottish Government are spending a whopping £8.1 million pounds of public money on salaries alone of some 225 lawyers. The Scottish Government's FOI stated that : "The Scottish Government has 3 main offices which provide legal services to the Scottish Ministers and agencies for which they have responsibility: the Scottish Government Legal Directorate, the Office of Scottish Parliamentary Counsel and the Legal Secretariat to the Lord Advocate. These offices together employ 139 lawyers (as at 1 April 2009). The total annual salary for these lawyers (including national insurance contributions and superannuation) in financial year 2008-2009 was £8,146,000. In addition, a further 86 lawyers are seconded to other government offices and inquiries as part of the Government Legal Service for Scotland. Those lawyers’ salary costs are met by the host office or inquiry." Scandal hit insurers Marsh & crooked regulators Law Society of Scotland & SLCC all get huge payments on the taxpayer. However, the Scottish Government failed to disclose in the FOI they also pay out huge bonuses to the legal staff as well as huge amounts of public money on their lawyers expenses claims, which include huge payments to the Law Society of Scotland for each lawyer's annual practising certificates, massive payments to Marsh UK for each of the lawyers indemnity insurance cover, and also a third gigantic payment to the Scottish Legal Complaints Commission to cover the complaints levy imposed on all solicitors working in Scotland who currently hold a practising certificate. Previous totals of lawyers working for the Scottish Executive revealed half of today’s number. In a country where legal representation is becoming harder to obtain through cost, prejudice by the legal profession against particular cases or clients, and refusals by law firms to handle legal aid work, the huge increase in solicitors working for the Scottish Government from around 114 in late 2006 to today's 225 (also apparently on the rise) is an astounding slap in the face to people who find themselves locked out of the Scots legal system through no fault of their own, and also a sharp reminder to UK taxpayers that vast amounts of money are being needlessly wasted on legal teams working for the Government whose only real purpose seems to be to "gum up the works so the Government can get its way" - according to a former Justice Department employee. Naturally, one might wonder what on earth over two hundred lawyers get up to, working for the Scottish Government. Why does the Scottish Government need to shell out so much of our money on lawyers when most of us cant get one to even write a letter without costing an arm & a leg ? Well, taking a deeper look into the likes of the Scottish Government Legal Directorate, and the Government Legal Service for Scotland (GLSS), much of their work revolves around giving legal advice to Ministers on legal matters, legislation, policy, issues relating to the Scottish Parliament, relations with Local Government, and also on correspondence & dealings with tens of thousands of ordinary Scots who contact the Scottish Government for help & assistance when problems occur with public services and the like. In another example, with regard to the use of tainted blood products in Scotland, it seems the Government employed lawyers offered plenty advice to Ministers from the previous and current administration on how to escape liability for the infections and even deaths of those who were infected in Scottish hospitals by blood products which almost certainly many knew had serious risks attached .. and there stands these duty bound taxpayer lawyers working for the Government, clamouring over each other to suggest ideas to delay enquiries, avoid liability, and ignore pleas for help from those victims of the blood products scandal … which, surely, is a little disgusting to say the least. You can read my earlier report on that, here : Scottish blood infections inquiry will be 'another whitewash' as documents expected to be withheld to cover up public liability. Whether copies of that advice will turn up at the Inquiry is anyone’s guess .. but I’m betting not. An example of inherent bias in the Government's Legal Service for Scotland can easily be displayed in the long and bitter battle to enact increased rights of audience in Scotland's courts, via Sections 25-29 of the Law Reform (Miscellaneous Provisions) (Scotland) Act 1990, which the GLSS and even the Civil Service wanted kept out of public reach. While communications flew back & forth between Government Departments on how to stall or even repeal the little known legislation which would have helped tens of thousands of Scots over the years who have been unable to secure legal representation in Scotland's courts, lawyers working for the current and previous administrations continually put the boot in against allowing wider competition in the Scottish legal services marketplace, issuing advice to Ministers on ways to delay for decades, the implementation of laws first passed in 1990 but only enacted in 2007 after the media became interested. At the end of the day, with access to justice in Scotland apparently being rationed only to those whose face fits with the legal establishment, why should taxpayers be shelling out millions of pounds for hundreds of lawyers to work for the Scottish Government, whose main aim seems to be to prevent the public from getting a fair hearing ? Law Society of Scotland investigation found McFarlane covered up £24,000 client theft by her own husband. In yet another case which demonstrates the lack of effective regulation of Scotland's legal services market and poor consumer protection, solicitor CATRIONA MACFARLANE, 49, of Hasties Solicitors, Glasgow, has been found guilty by the Scottish Solicitors Discipline Tribunal of professional misconduct but allowed to continue working as a solicitor. The findings reported by the Scottish Solicitors Discipline Tribunal (SSDT), said that Catriona Macfarlane’s actions had left her client in a vulnerable position and left them exposed to an unacceptable risk after it had been revealed she covered up her own husband's theft of £24,150 from a client who had approached Mrs Macfarlane to act for him in a house purchase deal. SSDT heard lawyer covered up husband’s massive theft from client after cash was handed over for mortgage. In August 2006, Mr. A approached a mortgage broker, identified as Ideal Mortgages, to arrange a mortgage, giving Mr Nigel Macfarlane £24,150 to be used as a deposit on a property, and approached Catriona Macfarlane of Glasgow Law Firm Messrs Hasties to act for him in the purchase. The client, Mr A, was not aware at this time, that Catriona Macfarlane was married to his mortgage broker, Mr Nigel Macfarlane, nor did Macfarlane disclose this relationship to her client. Problems with the mortgage caused the house purchase to be delayed, which prompted the client to call his solicitor, Mrs Macfarlane, informing her he had handed £24,150 to the mortgage broker, who Mrs Macfarlane had still not disclosed was her husband. The SSDT judgement reported that Mrs Macfarlane's only reply to her client's telephone call was "She said only that she would call him back". The Tribunal decision further reported : "She (Mrs Macfarlane) called back a short time later. She said that, having spoken to the broker, she was able to confirm that Mr A's money was safe and could be returned to him at any time. By this stage, she was aware that her husband had misappropriated Mr A's money. On 19 February, Mr Macfarlane came to Mr A's house and confessed … that he had spent his money. He promised to 'sort things out'." “Mr. A and his wife were by this time suspicious. Although Mr. MacFarlane and the Respondent referred to each other respectively as “the broker” and “the solicitor” they shared the same surname. Mr. A and his wife confronted the Respondent on 19 February 2007. She confirmed that she and Mr. Macfarlane were married. She said that she “would sort things out”. “On 26th February 2007 the Respondent advised Mr. A that she could no longer act for him and that he should seek separate representation. Mr. A was thereafter represented by new Solicitors. The transaction was completed in April 2007. All additional costs including penalty interest due to the sellers of the property were recovered from Nigel Macfarlane. The sums misappropriated by him were repaid in full." Solicitor Catriona Macfarlane, of Loganswell, Newton Mearns, Glasgow, and employed by Glasgow Law Firm Messrs Hasties Solicitors of Lynedoch Crescent, Glasgow, who was enrolled as a solicitor on 4 October 1982 was found guilty by the SSDT of Professional Misconduct in respect of her failure to disclose to her client the extent of her knowledge of her husband’s actings and her failure to timeously advise her client to seek separate independent advice and her failure to withdraw from acting for her client, all in breach of the Code of Conduct for Scottish Solicitors 2002. The Scottish Solicitors Discipline Tribunal issued punishment, censuring Mrs MacFarlane, and issued a fine of £2500 to be forfeit to Her Majesty and Direct in terms of Section 53 (5) of the Solicitors (Scotland) Act 1980. Further, Mrs Macfarlane was informed that for a period of 3 years, her practising certificate shall be subject to such restriction as will limit her to acting as a qualified assistant to and to being supervised by such employer as may be approved by the Council or the Practising Certificate Committee of the Council of the Law Society of Scotland. Mrs Macfarlane was also found liable in the expenses of the Complainers and of the Tribunal. A representative of one of Scotland's consumer organisations condemned the decision to allow Mrs Macfarlane to continue as a solicitor, also branding the fine & practising certificate reduction as "weak". “How can the public have any confidence in the legal profession if all solicitors get is a slap on the wrist and fine when they are caught in major wrongdoing such as this case where, according to the SSDT findings, the solicitor covered up for her own husband's theft of clients money." She continued : "I'm sure the public expected a lot more after the LPLA Act (2007) came into force but as we can see, the legal profession are still looking after their own, with the Scottish Legal Complaints Commission making not one bit of difference to the rising levels of fraud against consumers by their legal representatives." Justice Secretary Kenny MacAskill accused of being a soft touch on poor regulation of crooked lawyers. A member of the public who is experiencing huge problems with the Scottish Legal Complaints Commission and the Law Society of Scotland over his complaint branded the whole system of regulation of lawyers in Scotland as ‘a con against the public, and also condemned the Scottish Government for being soft on crooked lawyers. Crown Office silent on criminal charges against lawyers. The Crown Office were asked today if Catriona Macfarlane and her husband, Nigel Macfarlane, would face criminal charges for the cover up and theft of their client’s funds, which albeit were repaid, still rank as theft (which in most people’s book is still a criminal offence). So far, no response from the Crown Office, who are well known to have a soft touch against criminals in the legal profession itself, often apparently refusing to prosecute solicitors of even very serious crimes. A source at the Law Society of Scotland today alleged it had not passed on any details of any criminal activity detected during their investigation to the Crown Office, which is no big surprise, as the Law Society of Scotland usually cover up any details of criminal activity they discover during the course of their 'investigations' into crooked lawyers and I doubt the Scottish Legal Complaints Commission, had they been involved, would have done any different (another non-surprise). ‘Anti-client’ Scottish Legal Complaints Commission would have done no differently, issuing just another slap on the wrist. Trust in the Scottish legal profession will never be established until fully independent regulation (not the half-baked, half-house Scottish Legal Complaints Commission slap handed version) is enacted to protect consumers from thousands of cases of serious fraud, negligence and the poor handling of clients legal affairs which occur each year in Scotland. Please support the implementation of fully independent regulation for legal services in Scotland. Scotland's Lord President of the courts, Lord Hamilton. SCOTLAND'S CHIEF JUDGE LORD HAMILTON has been accused of "being deluded" over the use of McKenzie Friends in English Courts, and providing “a gravely mistaken account” to the Scottish Parliament's Petitions Committee of the attitudes of Scotland's Courts to unrepresented party litigants who have made requests for assistance in the form of a McKenzie Friend, only to be refused consistently by Sheriffs and even courtroom colleagues of the Lord President himself for a staggering FORTY YEARS while courts in England & Wales have without much trouble allowed McKenzie Friends to operate successfully & diligently over the same four decade period. Lord Hamilton attacked the petitioner, also challenged the introduction of McKenzie Friends in Scotland. In a bizarre outburst by the Lord President over the use of McKenzie Friends in England & Wales, Lord Hamilton alleged that McKenzie friends sat behind litigants in English courts (rather than in reality, beside them), and then proceeded to attack the member of the public who had raised the petition at the Scottish Parliament, a Mr Stewart MacKenzie, accusing him of failing to understand that Scottish courts had always allowed the use of McKenzie Friends. Amid all this, the Lord President failed to back up his claims with written evidence. Lord Hamilton's letter to the Petitions Committee stated : "As you will be aware, this expression, which owes its origin to English procedure, can be used in two senses : in its original sense it referred to an individual assisting a party litigant by sitting he hind him or her in court and assisting that litigant by making notes, helping with case papers or quietly giving advice on the conduct of the case, as well as providing moral support in court (Civil Courts Review, Chapter 11, para 42). The Lord President's claim that a McKenzie Friend sat behind the individual they had been called to assist in English courts was quickly rubbished by several institutions in England & Wales. A group which provides McKenzie Friends to unrepresented parents in need of legal assistance commented : "If Lord Hamilton thinks that a McKenzie Friend sits behind a party litigant he should make the journey south and attend cases where McKenzie Friends are being used successfully in England & Wales. He would plainly see the McKenzie Friend sits next to the litigant and assists them accordingly." An English barrister, asked for reaction on Lord Hamilton's claims, branded the Lord President's letter fantastic & ludicrous. He said : "The Lord President should stick to writing about things he knows about as he plainly does not know about the workings of the English courts system. Lord Hamilton is deluded if he thinks McKenzie Friends sit behind the very litigants they are there to assist." He continued : "If you think about it for one minute, what judge would allow a litigant to constantly turn around and ask questions, take advice, or be passed notes & papers throughout a hearing ? Having a McKenzie Friend sit anywhere other than next to the person they are there to assist is quite frankly, barmy." Lord Hamilton then went onto personally attack the petitioner, Mr Stewart Mackenzie's understanding of how Scottish courts deal with McKenzie Friends requests, claiming there was "never any difficulty with such assistance being provided". Lord Hamilton's letter went onto state : "Contrary to the apparent understanding of the petitioner in this petition, the Scottish Courts - certainly the Court of Session, and, I understand, also the Sheriff Courts - have never had any difficulty with such assistance being provided; it is the existing practice of the Court to permit it; there is no need for its "introduction". It is, of course subject to the control of the presiding judge, who, if the facility were being abused, would be entitled to stop it." However, Lord Hamilton's criticisms of the petitioner, and claims that Scottish Courts allowed the use of McKenzie Friends, were not backed up by a single shred of evidence provided by the Lord President in his letter to the Petitions Committee, and his assertions that courts had no difficulty with the use of McKenzie Friends were even rebuffed by insiders at the Scottish Courts Service, who admitted McKenzie Friends requests made by unrepresented litigants in Scottish courts WERE ROUTINELY REFUSED over the past 40 years to the present day. Lord Hamilton’s colleague Lord Woolman refused McKenzie Friend days after Lord Gill’s recommendation to allow. To make matters worse for the Lord President's claims to Parliament, a spokeswoman for the Scottish Courts Service admitted when questioned that a second request by an unrepresented party litigant for a McKenzie Friend in a long running damages action being heard in the Court of Session itself, was refused by Lord Hamilton's colleague, Lord Woolman, the day after the Lord Justice Clerk, Lord Gill announced his Civil Courts Review, stating that McKenzie Friends should be introduced to Scottish Courts. A spokeswoman for the Scottish Courts Service confirmed that : "The request for a McKenzie friend formed one part of a six part motion and was refused. There was no judgment issued nor reason recorded, only the decision." A senior solicitor from a Glasgow law firm confirmed today that McMenzie Friend requests were usually refused in Scotland, and that life was made as difficult as possible for those making the request. He said : "It doesn't take much to realise Scottish Courts do not want McKenzie Friends showing up to assist party litigants. Lord Hamilton's claims to the contrary are with respect, aloof from the reality those of us who work at the sharp end in the legal system know to be the case." He continued : "Anyway, if the Lord President is so convinced Scotland's courts are happy to allow the use of McKenzie Friends, why didn't he provide any details of such instances to the Parliament in his letter ? I think that omission speaks for itself because there are no such examples to give." A retired Sheriff today expressed his dissatisfaction with the tone of Lord Hamilton’s statements on the McKenzie Friends issue, particularly the idea that a McKenzie Friend might, in the words of Lord Hamilton, be asked to sit behind a party litigant in a courtroom. Lord Hamilton concluded : "Fresh rights of audience in Scotland have previously been conferred by primary legislation (see Law Reform Miscellaneous Provision) (Scotland) Act 1990 section 24 ("solicitor advocates") and section 25 )members of professional and other bodies. The judges are of the view that, if an equivalent to section 27(2)(c) of the Courts and Legal Services Act 1990 (or its common law source) is to be recognised in Scotland, this should be done by primary legislation. If that were done, it may be that the exercise of the discretion could be regulated by the rules of court." If there’s one thing for sure in all of this, it is that “discretion of court” certainly on the issue of McKenzie Friends, cannot be allowed to continue to strangle the rights of unrepresented party litigants of access to justice in Scotland’s courts. The facility of McKenzie Friends has operated successfully in England & Wales for 40 years, and in many countries around the world, who all mostly treat the request for use of a McKenzie Friend as a Human Rights issue. What we have seen is that in the 40 years since McKenzie Friends have existed in England & Wales, the Scottish Courts have consistently refused to allow litigants to use a McKenzie Friend, demonstrating well enough that Scotland’s courts cannot be trusted on applying discretion in use of McKenzie Friends. Given 40 long years have rolled by without almost a single McKenzie Friend in Scotland, it now falls to the Scottish Parliament to speak for the people of Scotland, and ensure that unrepresented individuals who cannot access justice simply because they cannot obtain the services of a solicitor, can, within a certain legislative framework which must be respected by the judiciary, apply for the use of a McKenzie Friend to assist their access to justice in Scotland’s courts, when so needed. If you made your lawyer an executor in your will, think again. Anyone who has written a will, making their lawyer an executor, either in a sole or joint position with another, are being urged to take immediate action to change their choice of executors after leaked complaints details revealed a huge rise in serious fraud committed by solicitors and other professionals against dead clients affairs they are charged with managing. Law Society of Scotland 'regularly whitewashed complaints against solicitors acting as executors'. Figures revealed on fraud against wills reveal the Law Society of Scotland, the governing body of all Scottish solicitors, has blocked or dismissed up to 80% of complaints made against lawyers who have seriously mishandled the estates of their dead clients, and in many cases committed serious fraud with large sums of money simply going unaccounted for and families losing out on rightful inheritances from their loved ones. The remaining 20% of complaints made against 'crooked lawyers' who have plundered the affairs of their one trusting, now deceased clients, usually end up in 'slap on the wrist' punishments with small fines or a weak reprimand, with the offending solicitor allowed to continue working, and only in the highest profile cases, do solicitors find themselves facing criminal charges, due to a policy of reluctance by the Crown Office to pursue members of the legal profession who actively, and it seems routinely commit crime. A spokeswoman for one of Scotland's consumer organisations today recommended that if a member of the public has written a will and appointed their solicitor or accountant as their executor, they should immediately reconsider their choice, preferably appointing someone closer to them by way of a relative, setting out clearly a set of instructions and a timeline by which an executor should handle the duties set out in writing in the will. She continued : "Instead of appointing a lawyer you think you can trust as your executor, appoint someone closer to you such as a wife or another relative, ensuring there are clear written instructions on what they should do, how it should be done, exactly how much they can be paid for what they do if you feel they should be paid, and exactly how long it should take to wind up your affairs after death, passing on whatever it is you wish your family, friends, a charity etc to inherit, within a given length of time and with the minimum of fuss." A legal insider today backed up the timely advice on wills, saying : "I am a solicitor, and I have clients who have written their wills with my firm. However I have refused all requests to be executor on an estate, and I can tell you from my own experience dealing with other legal firms in the cases of a deceased estate, there is no way I would ever appoint another solicitor to be my executor. It is a stupid move in today's society." “To prevent problems, people should take the simple step of making someone they really trust as their executor, and giving them strict instructions and time limits on how their affairs should be handled. This is very easy to achieve, if people would only use a little common sense in making sure whoever they choose to appoint as executor is locked into a certain agreement on what they can and cannot do." Scotsman reported on Law Society’s protection of Andrew Penman who ruined estate. For years its been well known in the legal profession that handling a will is almost like having a license to steal because at the end of the day you know the Law Society will back solicitors up 100% against any complaints over what went wrong. Readers will be familiar with my own past on this issue, where a crooked lawyer by the name of Andrew Penman of Stormonth Darlng Solicitors, Kelso teamed up with an accountant (and executor), Norman Howitt now of Borders accountants JRW Group, to ruin my late father's estate, details of which can be read HERE here and HERE. Even serving one's country it seems, is no guarantee to not being ripped off after death by crooked lawyers out to line their own pockets, with the likes of the good old Law Society of Scotland and the Scottish Legal Complaints Commission sitting back and doing absolutely nothing. Sadly, these are but a handful of cases brought to my attention recently where lawyers & accountants, mistakenly appointed as executors in wills by ever trusting clients, have ended up fleecing the funds entrusted to them, for their own personal gain. My own advice to anyone writing a will, or anyone who has written a will, is, if you have appointed a lawyer as your executor, go back and re-write your will immediately naming someone you really can trust to handle your affairs after death. Please, also take the advice of consumer organisations to stipulate exactly how and who should respect your wishes after you die, ensuring you also place limits on, or forbid the use of overdraft accounts by solicitors which are ostensibly used by the legal profession to waste your money with High Street banks in bargaining to secure cheap personal finance for lawyers. Taking these steps and taking the time to carefully think through your final wishes will save your remaining family a lot of heartache and ensure what you want actually occurs, rather than allowing the legal profession and others to march off with what you may have wished to go to your loved ones.